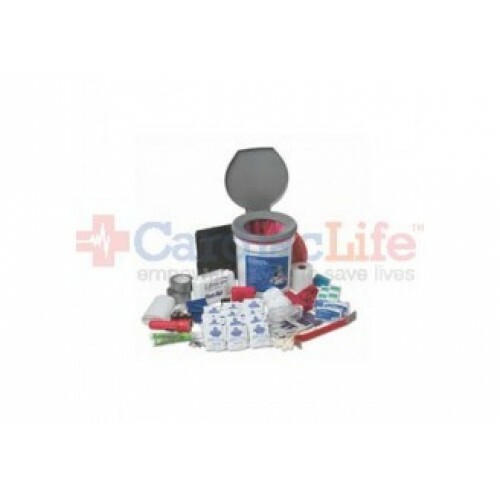 This compact emergency kit is the base unit upon which to build a complete emergency preparedness solution for your school. One kit should be provided in each classroom with additional units in other areas where students and staff congregate: libraries, cafeterias, gyms, auditoriums, and offices.This kit is specifically designed for schools using recommendations from leading disaster response organizations. It meets the immediate needs of up to 25 students and 1 teacher. Kept in each classroom, this survival kit can be of particular help in providing the emergency supplies that may be needed in a lockdown situation in which students and staff cannot leave the classroom. 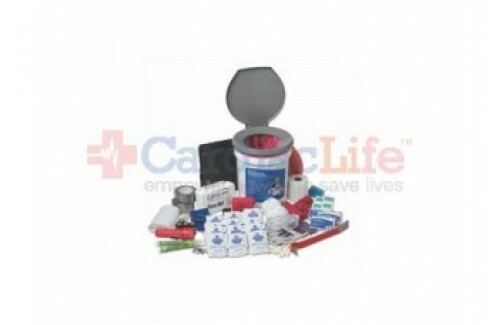 The emergency kit provides the essential emergency supplies most needed for support in the first several hours after a severe emergency or disaster: emergency instructions, search and rescue supplies and tools, dust masks for easier breathing, first aid, water [5-year shelf life, and items that supply warmth, shelter, communication, light, and sanitation. The sealed 5-gallon bucket provides compact, airtight storage. The bright orange lid identifies the kit in an emergency and is tamper-evident for security while stored. With the Snap-On toilet seat in place, the bucket serves as an emergency toilet when access to working toilet facilities is not available. A document pouch is attached to the back of the container and can be easily removed for quick access to emergency information: emergency instructions, emergency response plans, class rosters, etc. For a full 24 hours of support in an extended emergency, purchase one"25-Student EXTENDED SUPPORT kit (21010)" for each day of anticipated stay (preparation for 3 days is recommended). Simply match your purchase to the requirements of your school's Emergency Response Plan. Packed in a waterproof 5-gallon bucket with carrying handle, airtight tamper-evident lid, and removable emergency document pouch. Dimensions and Weight: 15 in x 13.5 in x 13 in, 23 lbs.